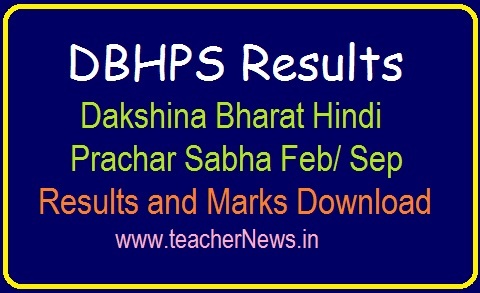 DBHPS Results (Marks) 2019 | Dakshina Bharat Hindi Prachar Sabha February 2019 Results: Dakshina Bharat Hindi Prachar Sabha examinations Conduct in Hindi, viz, Parichaya, Prathamik, Madhyama, Rashtrabhasha, Praveshika, Rashtrabhasha Visharad, Rashtrabhasha Praveen, and Nishnath. DBHPS Results Feb 2019 Dakshina Bharat Hindi Prachar Sabha February 2019 Results, Andhra Pradesh Telangana. This wing also conducts Examination in Hindi Typewriting (Lower, Higher & High Speed) and Shorthand in Hindi. These examinations are recognized by the Central and State Governments. Examinations are conducted twice a year in February and August/ Sep 2019. DAKSHINA BHARAT HINDI PRACHAR SABHA, Andhra Pradesh & Telangana, Hyderabad-4. (Provincial Branch of Dakshina Bharat Hindi Prachar Sabha, Madras). LOWER EXAMINATION RESULT: FEBRUARY -2019 the following is the provisional list of register numbers of candidates who have come out successful in Lower examinations held on FEBRUARY - 2019. Students can download the PDF File containing the Results and Search Their Name. The PDF Results file contains Parichay 2019 Results, PRATHAMIC Results 2019, MADHYAMA Results 2019, RASTRABHASHA Resuls 2019, PRAVESHIKA Results 2019 from AP and Telangana State. Dakshina Bharat Hindi Prachar Sabha Feb 2019 Results (Marks) of Parichaya, Prathamik, Madhyama, Rashtrabhasha, Praveshika, Visharad, Praveen, and Nishnath. DBHPS Results 2019.